One Nation and the Greens’ paths cross in an otherwise uneventful reading of the BludgerTrack poll aggregate. Still only the weekly Essential Research results to go on so far this year, and this week’s figures have made very little difference to this week’s reading of BludgerTrack, except that Labor gains an extra seat in Queensland. Also of note is that One Nation’s upward trend shows no signs of abating, with the party now level with the Greens. Nothing new this week on leadership ratings. The looming resumption of parliament suggests Newspoll’s end-of-year sabattical will come to an end either Sunday or Monday night. The only pollster to have reported so far this year finds One Nation reaching double figures, amid an otherwise stable set of results on voting intention. The steady ascent of One Nation continues in this week’s fortnight rolling average from Essential Research, which finds the party up a point to 10% to surpass the Greens, down one to 9%, with the Coalition, Labor and Nick Xenophon Team steady on 35%, 37% and 3%. Labor’s lead on two-party preferred is unchanged at 54-46. The poll also finds Australia’s “current political and economic system” is deemed in need of fundamental change by 40%, refinement by 44%, and no change by 6%. There are also familiar findings about who does and doesn’t pay enough tax (61% say mining companies pay too little, 72% the same for large international companies, and religious organisations come in at 58%). Sixty per cent rated that higher tax on multinational companies would be good for the economy, versus 11% for bad. On trade, 47% say free trade agreements are, generally speaking, a good thing for Australia, versus 15% for bad – which I’m a bit surprised by given other recent trade-related findings. Fifty-two per cent thought Australia should pursue a Trans-Pacific Partnership type agreement without the United States, versus only 19% who thought it should pull out. Sketchy though it is, the polling evidence so far this year suggests a turn for the worse for the Turnbull government. BludgerTrack is being heavily determined at present by the two new year data points from Essential Research, but for what those data points are worth, they suggest the government may have entered a new phase in its polling fortunes. The latest result has wrenched two-party preferred almost a full point in favour of Labor, although this has only yielded a gain of one on the seat projection. The change is a straightforward result of Labor taking primary vote share off the Coalition, with One Nation failing to gain further ground for the first time in a while. • Mike Baird’s departure from the premiership and the parliament will result in a by-election for his seat of Manly. Labor is not competitive in the seat, which corresponds with Tony Abbott’s federal seat of Warringah, but it was held by independents for 16 years until Baird unseated David Barr in 2007. Potential Liberal preselection nominees identified in media reports include James Griffin, KMPG director and former Manly deputy mayor; Alex Dore, NSW Young Liberals president and management consultant; Natalie Ward, a private legal practitioner who relinquished a job as a political staffer in 2013 amid controversy over her marriage to David Begg, a co-principal of the lobbying firm associated with moderate powerbroker Michael Photios; Ron Delezio, founder of a hospital charity and father of Sophie Delezio, who suffered horrific injuries when a car crashed into a childcare centre in 2003; and Walter Villatora, a local party identity and advocate for preselection reform. • The second New South Wales by-election will follow today’s resignation by Health Minister Jillian Skinner as the member for North Shore, ahead of her anticipated demotion to the back bench. North Shore neighbours Manly to the west, and is similarly solid in its conservatism. The Sydney Morning Herald reports that Liberal preselection contestants may include Felicity Wilson, a former Property Council executive, and Tim James, former chief of staff to Energy Minister Anthony Roberts. The Coalition primary vote sinks to the mid-thirties, as One Nation nudges ever closer to double figures. This week’s Essential Research fortnight rolling average result finds Malcolm Turnbull slipping a point further towards the danger zone, with Labor’s lead now at 54-46. 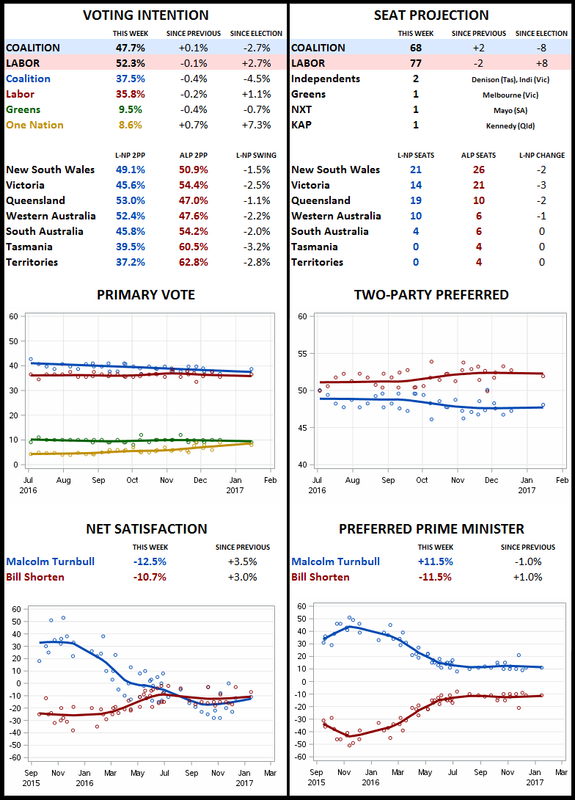 It also has One Nation once again reaching a new peak, of 9% (up one on the final poll of last year), with the Coalition now only able to manage 35% (down two), and Labor, the Greens and Nick Xenophon Team steady on 37%, 10% and 3%. The poll also finds 36% approval and 48% disapproval for the Centrelink debt recovery program, from a question with less problematic wording* than was offered in the GetUp! poll by ReachTEL. Those opposed were more likely to do so strongly (29% of the total compared with 19% for less strongly) than those in favour (13% strongly, 23% less strongly). Another question finds 46% more concerned about politicians’ expenses than welfare overpayments and 8% vice-versa, with 40% opting for both equally. A series of national identity questions to coincide with Australia Day includes a finding of 44% support and 30% opposition to Australia becoming a republic, which is more favourable than other such poll results in recent years – no doubt because the question specifies “a republic with an Australian head of state” Also featured is an occasional question on “trust in institutions”, which finds an across the board improvement since September, except for the ABC, environment groups and the Commonwealth public service, which are steady. Police forces and the high court continue to rate best, parliaments, religious organisations and trade unions worst. In other polling news, Ipsos has a global survey on the American presidency that finds a very narrow band of results internationally with respect to Barack Obama (with the dramatic exception of Russia), with Australia being fairly typical in having 84% rating him good and 16% poor. Views on Donald Trump are a little more diverse, with Australia ranking at the low end in having 25% expecting he will be a good president compared with 75% for bad. Australians are evenly divided on the question of whether he will make it to the end of the year without being impeached. One stray poll brings the BludgerTrack aggregate back to life, but the result is much the same as it was at the close of business last year. BludgerTrack returns following the break of the New Year polling drought, courtesy of GetUp! ReachTEL poll and the year’s debut for Essential Research – although BludgerTrack features only the latter, as it includes only media polls for the sake of consistency. Since the Essential result is the only data point available from the past month, it more or less single-handedly determines where things currently stand, which is to say in much the same place as they did before the start of the drought. The Essential results on the primary vote were Coalition 38% (up one), Labor 37% (steady), Greens 9% (down one), One Nation 8% (steady) and Nick Xenophon Team 4% (up one), with Labor maintaining its 53-47 lead on two-party preferred. Being the first poll of the year, these results are purely from a one week sample of 1017, and not a rolling average combined the results of two consecutive weeks. The poll also featured the monthly leadership ratings, which both leaders down on “don’t know” for their personal approval. Malcolm Turnbull is up three on approval to 37% and two on approval to 48%, while Bill Shorten is respectively up two to 37% and six to 44%. Turnbull’s lead as preferred prime minister is unchanged at 39-28. Essential did not features its usual supplementary questions on selected current issues this week, but we do have an international survey by Ipsos that used a variety of measures to probe for Trumpian sentiment around the globe. This found Australia generally landing in the middle of the pack, but one exception was that 48% of Australians rated their country as being in decline, which compared favourably with most other countries – in particular the United States on 60%, and the United Kingdom on 57%. Given the circumstances of his departure, and his success in keeping his nose clean as leader of a state that has become proverbial for political malfeasance, most reacted to the news sympathetically (Mark Latham being a seemingly inevitable exception). Even so, Baird leaves office with a patchy electoral record, and with recent polls suggesting the public was growing increasingly disenchanted with his leadership. Reports this week suggest the next targets will be disability support and, particularly dangerously, the aged pension … The highest concentrations of those on unemployment benefits tend to be in low-income areas of the big cities and remote regions with high indigenous populations. The former account for the most reliable Labor territory in the country, while electorates encompassing the latter usually bring together white conservative and indigenous Labor voters, with the former being decisively greater in number. But when pensioners come in to view, real problems start to emerge — especially for the Nationals, whose rural and regional heartland is distinctive for being whiter, poorer and older than the big cities. Clear at the top of the list for the LNP is Lockyer, which covers the rural areas between Ipswich and Toowoomba … Labor’s danger areas include the two seats that cover Hanson’s old stamping ground of Ipswich, where the threat is intensified by the weakness of the LNP, since the One Nation candidates will have a low bar to clear in overtaking the LNP and scooping up their preferences. A GetUp! commissioned poll records the government sinking, One Nation nudging into double figures, and widespread hostility to the government’s shakedown of welfare recipients. The Fairfax papers report that a ReachTEL poll commissioned by GetUp! has Labor leading 54-46 (I wouldn’t normally give a non-media poll its own post, but you take what you can get at this time of year). When responses for a separate follow-up question prompting the 7.8% undecided are integrated into the result, the primary votes are Liberal 33.8% and Nationals 3.2% (a combined 37.1%, compared with 42.0% at the election), Labor 35.0% (up 0.3% on the election), Greens 9.8% (down 0.4%) and One Nation 10.6%. The poll also finds 46.2% supporting and 31.8% opposing the government “stopping the automated debt collection system”, though I wonder if the wordiness of the preceding explanation* and the negatively framed question might have caused confusion, resulting in opposition being understated. Certainly that might help to explain the finding that more respondents (49.8%) said the system had made them less likely to vote for the Coalition than said they wanted it stopped. Of the remainder, 14.4% said it had made them more likely to vote for the Coalition, while 35.8% said it would make no difference. A GetUp!-styled money shot question found 82.2% responding that “cracking down on corporate tax dodging” should be a “higher priority for the Turnbull government”, compared with 17.8% who favoured recovering debts from Centrelink overpayments, with even Liberal voters dividing two to one in favour of the former option. A further question had 78.6% responding that the burden of proof in establishing wrongful overpayment should fall on Centrelink, compared with 21.4% for the recipient – though here too the question is a bit wordy for my tastes**. The automated phone poll was conducted on Thursday from a sample of 2126.